I really love Korean food. Part of it was due to living in a town that was heavily populated by Koreans when I was in the US – people on the streets or in the shops didn’t necessarily speak English! Part of it is also the reinforcement from Korean movies that seemed to feature gorgeous looking actors/actresses slurping spicy noodles or shoveling spicy rice in while gazing into each others’ eyes. Ok – moment of confession. I do watch some Korean series. I’m not big on them because I find that once I start I really can’t stop, so I’ve kept the watching to a bare minimum, and probably the only recent one I watched was Descendants of the Sun. There is something so irresistible about these feel-good shows. The sad news is that I have stopped going out to eat Korean food. I’ve realized that similar to Thai and Vietnamese food, Korean food has a lot of hidden sugars and starches. I used to wonder why even my homemade Korean stews needed higher amounts of insulin to cover the meal – but I realize now that a lot of the soy bean and chili pastes used in Korean food is made with sugar, glutinous rice and other higher carb grains like barley. So nowadays I don’t really go to eat Korean food unless the options include barbecue meats that are not marinated. So when the craving came on me, the obvious thought was to have kimchi fried rice that I could make from cauliflower instead of rice. The next tricky bit was to find a substitute for gochujang which is a kind of chili/fermented soybean paste. Gochujang is a staple for Korean cooking and comes in neat little boxes in the supermarket. 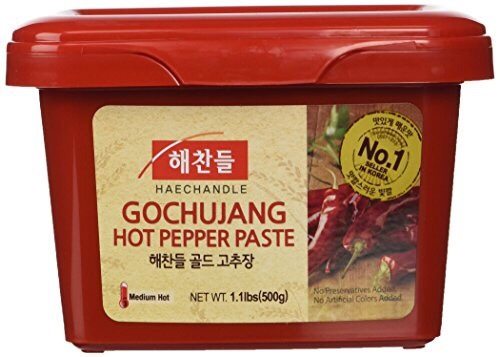 Lately I’ve been tempted to reach out and buy gochujang and daenjang which are all essentials in a Korean kitchen. But I resisted, remembering how badly I spiked on these. 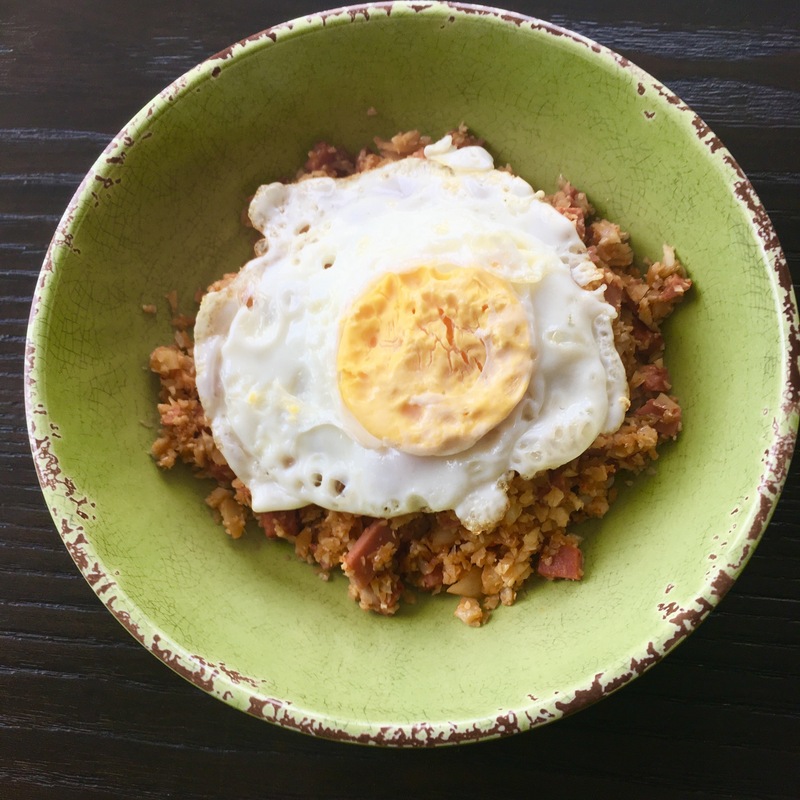 So for the kimchi fried rice, I used Chinese fermented soybean paste (tau cheo) – this was only 3g carbs compared to 10g carbs per tablespoon of gochujang. The spiciness was mostly from the kimchi itself, although adding chili powder could also amp up the spice factor. I’m not sure if my Korean friends would throw up their hands in horror since I susbstituted a quintessentially Korean ingredient for a Chinese one, but I think I sort of replicated the essential flavours of kimchi fried rice. Korean Gochujang is a chili paste with fermented soy beans, glutinous rice and barley. 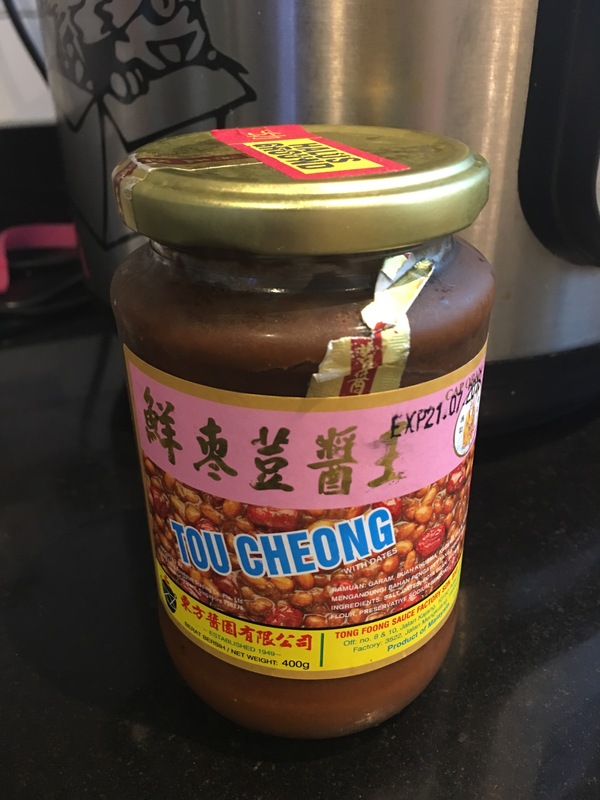 Tau Cheo (or Tou Cheong 豆浆）is a fermented yellow soy bean paste that is a staple in most Chinese homes. I think there was something really satisfying about tucking into the kimchi cauliflower fried rice. I didn’t really miss the starchiness or regular rice and the spiciness of the kimchi was balanced by the umami soybean flavour. I felt transported into an old episode of The First Shop of Coffee Prince! Place the cauliflower florets into a food processor and chop into small rice-sized pellets. Set aside. Fry the eggs sunny side up and set aside. Heat the oil in a large frying pan, and fry the garlic over medium heat till fragrant. Add the luncheon meat and fry for another minute. Add the kimchi cabbage and tau cheo to the pan and fry through, mixing the ingredients well. Add the cauliflower rice, as well as the soy sauce, sesame oil and white pepper. Chilli powder can also be added if you want a spicier dish. Fry for another 4-5 minutes till the cauliflower is softened. Be careful not to overfry as the cauliflower will turn soggy. Serve hot with the fried egg on top.